It is the time of year when we all celebrate our loved ones and our animals here are no different. 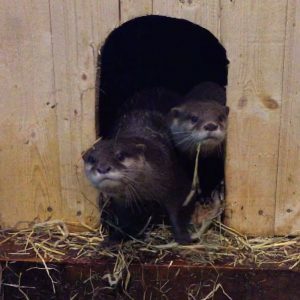 Have you met our adorable pair of otters? Indra and Gizmo spend all of their time together, and although they occasionally fight, they are madly in love. Gizmo loves to look after Indra and even shares his food with her – it must be love! Although he is a few years older then her, Gizmo, still manages to keep up with Indra and they spend a lot of their time chasing each other around their home. The seahorse is one of the most romantic creatures in the sea. Once they find a mate, they stick with them for life. 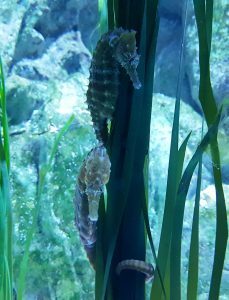 At Blue Reef Tynemouth you often see pairs of seahorses holding tails, to make sure that they don’t lose each other. These affectionate animals may look odd, but they are very loving! Every morning they perform a courtship dance, this strenghtens their bond and in the wild, is their way of checking that they are still together. There is one thing Marvolo the seal loves more than fish and that is giving kisses. 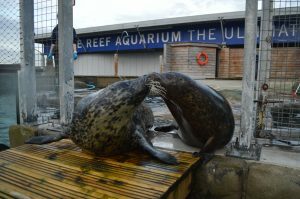 He will kiss anyone who lets him, including the team of Aquarists at Blue Reef Tynemouth. Marvolo is the resident ladies man and has fathered 3 seal pups. He will often be seen with his current partner Loffe. There are many more romantic tales from under the sea, so why don’t you bring your valentine for a date with a difference.